We thought that you might like to know a little more about the founder of the Algarve Society of Artists and the editor of this site, Alyson Sheldrake, and her husband Dave. Since moving out here to the Algarve to live permanently six years ago, they have both been steadily and excitingly building up their new careers, with Alyson fulfilling her dream to have a home studio and to work as a full-time professional artist; and Dave to bring forward his dreams from many years ago when he had his own dark room in the bathroom, that one day he would be able to work as a professional photographer. They first arrived out here and spent an entire winter honing their respective skills, with Alyson experimenting and painting every day in her studio until her unique ‘New Wave’ style emerged; and Dave set himself a challenge called ‘Portugal 365’ where he set out every day with his camera determined to take a photograph good enough to post on his newly created Facebook page, with the aim of posting every day for a year. Their days working in the UK quickly faded into history; Dave had retired after serving for over 31 years as a Police Officer in the Devon and Cornwall Police, retiring as a Sergeant; and Alyson, having served for 13 years in the Police, escaped and worked her way up the education tree to reach the dizzy heights of a Director of Education for the Church of England. They are forever indebted to the wonderful Holiday Inn Algarve hotel and their Sales Director Vicki Good, for inviting Alyson and Dave to host their first ever joint exhibition of art and photography work for sale at their hotel in Armação de Pêra. The hotel, together with its partner hotel, the Hotel Carvoeiro Sol, have since hosted numerous exhibitions and events for the artistic couple, and they look forward to more again in the future. She also enjoys painting Pet Portraits too. Dave is never happier than when he has a camera in his hands – especially if he can also combine that with a trip out to the West Coast to enjoy the stunning and unspoilt beaches of the region. He specialises in property photography, events and celebrations, private commissions, portraits and commercial work. Their motto has always been ‘Affordable Art for all to Enjoy’ and their hope is that this new venture, creating the brand new Algarve Society of Artists and this Algarve-Art website and quarterly newsletter, will help them to share some of the experience and knowledge they have gained over the last few years working as artists out here in the Algarve; and also to be able to bring together a wide range of styles and genres of art and artists together, to be able to network, share and support each other. 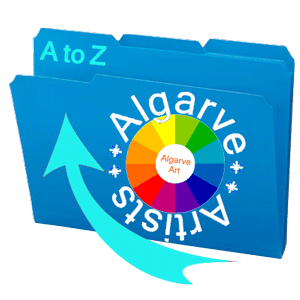 Being able to promote art of all types across the Algarve, and to showcase and highlight the many wonderful artists that live and work out here, seems like a very worthwhile cause to this artistic and dynamic duo.